Experience the majestic Cape Breton Highlands from the mountains to the sea! 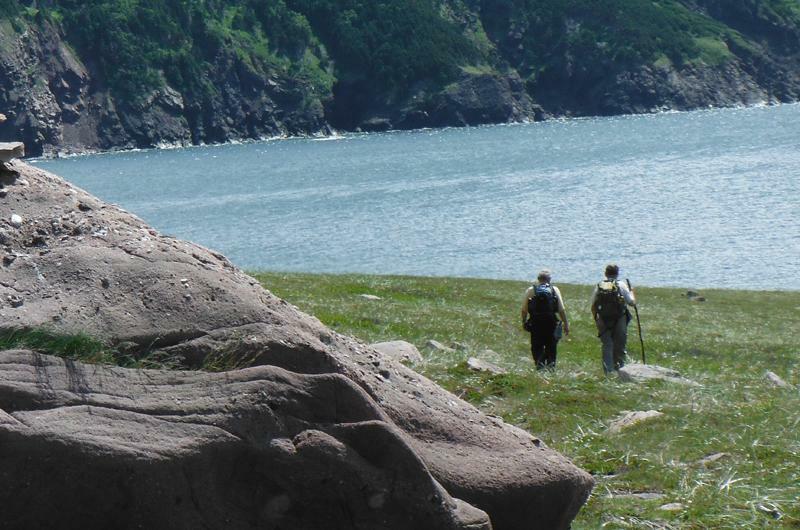 Join us on a full day, guided hike along a northern mountain trail to a remote coastal meadow. See the ruins of Cape Breton’s northern most lighthouse. Explore the windswept coastline and hear the stories of the people who once carved out a living between the rocks and the sea. Our trained guides will take you on a sea kayaking adventure through of the wonders of Cape Breton’s natural environment. Paddle along gypsum cliffs and through pristine salt water marshes. Learn about the oyster aquaculture industry and explore untouched beaches. The area is home to bald eagles, willets, plovers, terns and moose. Stop at the beach for a picnic with shipwreck stories and local history. Next, you’ll take a half day whale watching tour with Oshan Whale Watch. You’ll enjoy the spectacular scenery while watching for whales, seals and eagles. This family has been fishing the local waters for five generations. Finally, you’ll cycle along our local fishing communities with our half day Atlantic Fisheries Cycling tour. We explore local trail, beach roads and busy fishing wharves. The tour stops to talk about the different styles of lobster traps, crab fishing gear and boats. We also take a break at the St. Paul Island Lighthouse Museum, climbing to the top of the lighthouse and touring the museum with a local guide. Email us at cabotrailadventures@gmail.com to book your tour.